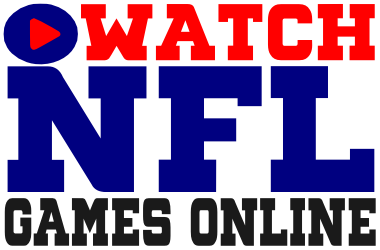 If you are looking for a weekly NFL distribution map for listings of every NFL football game and network then you have come to the right place. The NFL currently broadcasts 256 regular season games, 12 post season playoff games and one broadcast for the ultimate championship – the Super Bowl. Each week during the regular season the NFL broadcasts 14 to 16 games, depending on team bye weeks, on CBS, FOX, NBC, ESPN and the NFL Network. View our NFL TV Schedule to see what time and network your team is playing on. ESPN owns the rights to Monday Night Football. The NFL Network and CBS broadcast the Thursday Night NFL games and NBC hosts Sunday Night Football games. CBS and FOX broadcast all of the Sunday afternoon games. The two networks alternate doubleheader weekends – FOX televises both early and late games during Weeks 1, 4, 6, 8, 11, 12, 14, 15 and 17 and CBS has the NFL doubleheader on Weeks 2, 3, 5, 7, 9, 10, 13, 16 and 17. 506 Sports offers the best NFL Distribution Maps online. 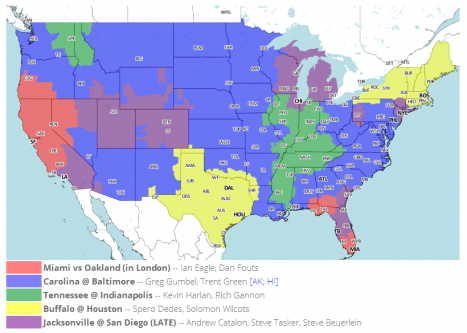 The distribution maps for the NFL and college football are in full color and tell you what teams are playing on the networks in your area.